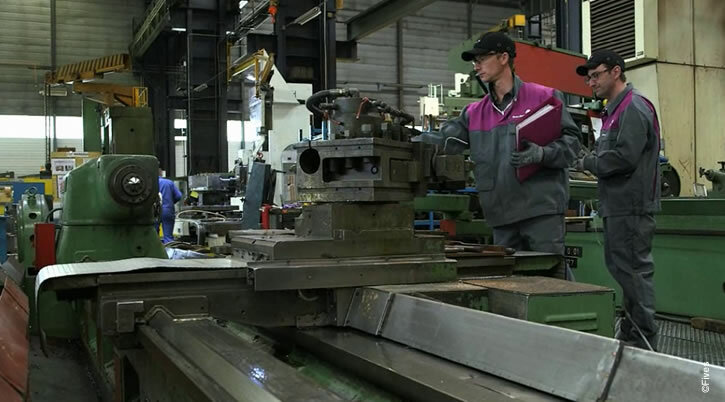 Over the course of 15 years, Fives Maintenance has become one of the leading industrial maintenance companies in France. Cinetic Service was founded – a company specializing in automated systems maintenance. Cinetic Service took over maintenance for a terminal in one of the largest airports in France. Maintenance contracts were signed in the automotive industry with a French car manufacturer. The first facilities maintenance contracts were signed for postal sorting centers. Cinetic Service branched into the aerospace sector, signing a contract with one of the largest French equipment manufacturers. Cinetic Service adopted the Fives Group's new visual identity and the Fives Cinetic brand. Fives Nordon, another Fives Group's company, awarded a contract for the maintenance of its production equipment to Cinetic Service. Cinetic Service completed its first postal machine transfer and signed a new contract in the aerospace industry. Cinetic Service manage maintenance of sorting machines at new branches. Fives Industries, another Fives Group's company, signed over the maintenance of its production equipment to Cinetic Service. Cinetic Service began operating in the railway sector by signing a contract with a major passenger transit company. One of the major manufacturers in the energy field also awarded Cinetic Service with a contract for the maintenance of its production equipment. Cinetic Service was ISO 9001 and ISO 14001 certified. Cinetic Service consolidated its position in the aerospace industry by winning a bid to expand one of its contract's scope and opening two new locations. Cinetic Service consolidated its position in the railway market by opening a new location. Cinetic Service launched its training school, created in partnership with the AFPI of Yonne in response to the lack of maintenance technicians specialized in machine-tool. The company was OHSAS 18001 certified. Cinetic Service expanded its activities in the railway sector by opening a new location. To make its offer more understandable, the Fives Group gathered all its activities under a single brand and created 19 business lines. As part of these changes, Cinetic Service became Fives Maintenance under the Maintenance specialism. Fives Maintenance started operations in Belgium with a new customer in the aerospace industry. Fives Maintenance took on a new structure by creating 6 agencies on the French territory. Fives Maintenance was MASE certified. Fives Maintenance branched into the aerospace sector and the railway market by opening new locations. A defense manufacturer awarded a contract for the maintenance of its production equipment to Fives Maintenance. Fives Maintenance won a new contract to manage maintenance for sorting machines at new branches. An aerospace manufacturer awarded a contract for the maintenance of its production equipment to Fives Maintenance.